Here's a fun factoid for all you film fans out there: Given that Disney's Sleeping Beauty was released on Jan. 29, 1959, and 101 Dalmatians bowed in theaters on Jan. 25, 1961, this animated classic was cranked out in less than two years. That's pretty impressive in itself, but then factor in the fact that, in the wake of Sleeping Beauty underperforming at the box office, there were massive layoffs at Walt Disney Animations Studios in the late winter of 1959, with the staff being cut from 551 artists and animators to just 75. 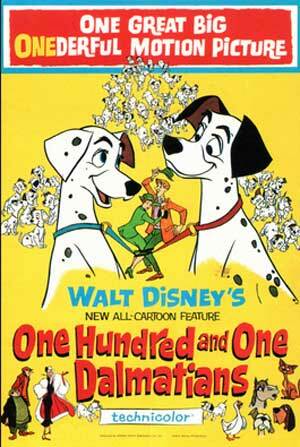 So how was Disney able to produce 101 Dalmatians on that short a schedule with such a small team? To be honest, a lot of the credit should go to Xerography, which was this then-brand-new production technology that allowed animators' drawings to be transferred directly onto cells, thus eliminating the need for inking. That technological innovation really helped streamline Walt Disney Animation Studios' production process. But at the same time, one of the main reasons that 101 Dalmatians came together so quickly is that Walt had some of his very best men working on this animated classic. Take, for example, Marc Davis. 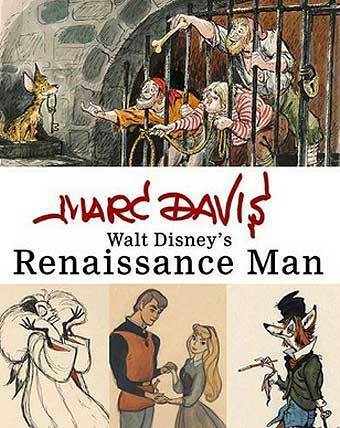 Quite simply, Davis was Disney's Renaissance man, a talented artist who started working at the Studios on Snow White and the Seven Dwarves and eventually worked his way up to becoming the lead animator for such iconic Disney characters as Cinderella, Alice (in Wonderland), Tinker Bell and Maleficent. It was actually Davis' masterful work on the Mistress of All Evil for Sleeping Beauty that led to his being assigned Cruella de Vil. But given that 101 Dalmatians was Walt Disney Animation Studios' first film to be set in a contemporary setting, well, Davis wanted Cruella to be a real departure from everything that he'd done with Maleficent. He wanted her to be the first modern-day Disney villain. Mind you, Davis wasn't working from a blank slate. 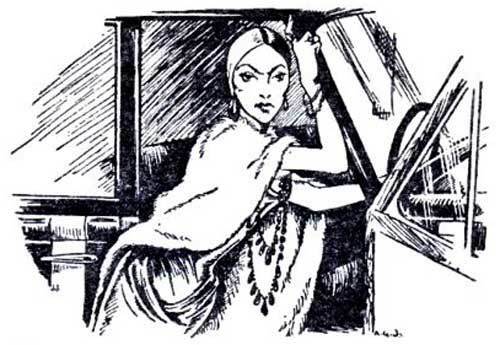 He had the illustrations of Cruella that had been created for Dodie Smith's The Hundred and One Dalmatians back in 1956. 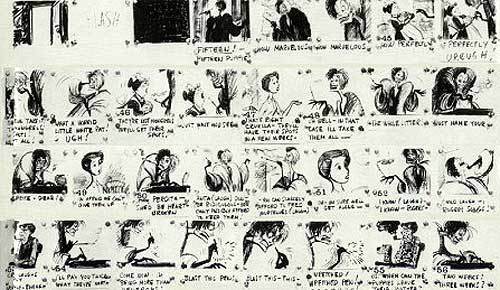 He also had all the storyboards that Bill Peet had created as he was adapting Smith's book to the screen. But Davis -- because he was determined to make Cruella as contemporary as possible -- looked beyond Smith's book and Peet's storyboards. He began searching for someone in the real world whom he could then use as the model for this fiendish fashion maven. And he eventually found her at a cocktail party that he and his wife Alice attended in the late 1950s or early 1960s. ...it's often been suggested that Davis was inspired by one of the wives of the other artists and animators he worked directly with at Disney. But the inspiration for Cruella came from within the Davis family's very small circle of friends. 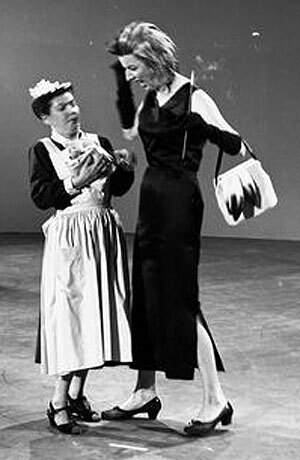 That said, in order to further obscure the identity of the acquaintance who inspired the flamboyant way that Cruella moves and acts, Davis had veteran character actress Mary Wickes come in to shoot some live-action reference footage for the film. And a lot of the comic choices that Wickes made Davis then incorporated in Cruella. But as to who the family friend was who served as the inspiration for this Disney villain, Davis took this secret to the grave when he passed in January 2000. And while his wife Alice is still with us, she honors her husband's wishes and, to this day, has not revealed who the real-life inspiration for Cruella de Vil is or was. But Davis' modern-day Disney villain proved to be just as big a hit as Maleficent was. In fact, Cruella was such a memorable character that, when Walt Disney Animation Studios was developing The Rescuers in the early 1970s, they actually toyed with the idea of making her the main villain of that animated feature. Imagine Cruella as the one who forces poor orphan Penny to go down into that tidal cave in search of the Devil's Eye. 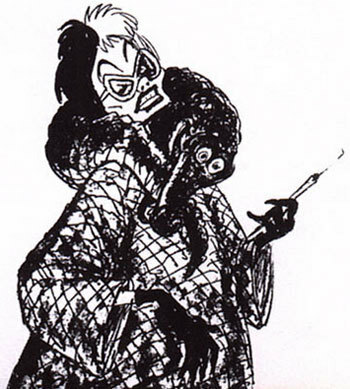 This idea even made it far enough along Walt Disney Animation Studios' development track that some concept art was actually put together that showed Cruella draped in some bayou-inspired fashion. But in the end, Cruella didn't get her animated encore. 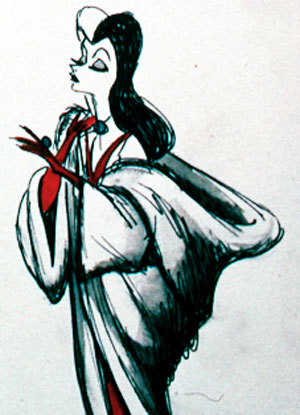 WDAS artists eventually decided that The Rescuers needed an entirely new villain, one Madam Medusa, to drive that film's story. Which isn't to say that Davis' contemporary creation entirely retreated to the shadows. Glenn Close memorably brought this animated character to life in two John Hughes productions, 1996's 101 Dalmatians and 2000's 102 Dalmatians. And if Disney development executives have their way, she will soon return to the big screen in a big way in Cruella, a live-action film that is being scripted by Aline Brosh McKenna, who, appropriately enough, is probably best known for having written the screenplay for The Devil Wears Prada. Of course, what's kind of ironic about all this is that whenever any performers have portrayed Cruella de Vil over the past 20 years, they've always imitated Betty Lou Gerson's distinctive cigarette-tinged vocals. But Walt Disney once had a very different voice in mind for Cruella, one that took its inspiration from Zsa Zsa Gabor. The "diamond edition" of Disney's 101 Dalmatians (which is the first time this animated classic will be available in the Blu-Ray format) hits store shelves Feb. 10.